It’s hard to believe it was 70 degrees on Saturday. I was riding my scooter in the sun (and fierce winds) and now on Sunday, I was looking for something heavier than my gray hoodie. That still didn’t stop me from carrying out the plans I had. For the last 7 years, Salt Lake City has been moving forward in expanding their public transportation solutions. 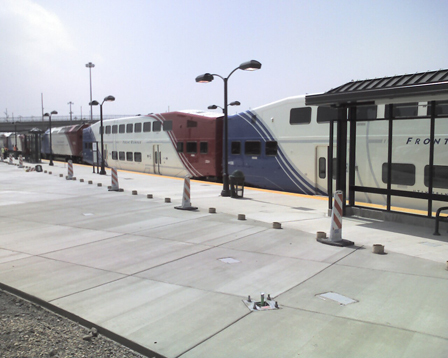 In December 1999, TRAX (our light rail system) opened. A few years ago, a second leg of the light rail opened. And Sunday was a vendor preview of the new commuter rail, Front Runner. This train, unlike the smaller light rail trains, is full-sized. With a top speed of 79 mph, it gets up and moves. And it was smooth as it traveled the full destination: Salt Lake to Ogden, with the occasional stops at all of the completed rail stations in between. I’ve always been a big supporter of public transportation. I mean, I could live in New York if I needed to, hopping on and off subways and rail systems without an issue. 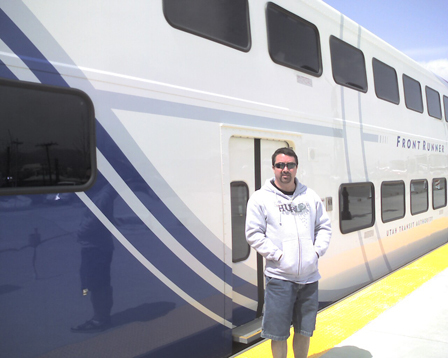 When I worked in downtown SLC, I rode TRAX every day, only driving to work twice in an 18-month period of time. At this time, I don’t live that far from work (a bit more than 3 miles each way), so the scooter and my car take me where I need to go. But I often choose rail over car when they are available. So any trips I need to take to Ogden, I’ll be sure to take Front Runner. It’s no secret that I love to BBQ and I always look forward to summertime so I can cook up some great meals: burgers, salmon, steak, shish-ka-bob and anything else that tastes good bar-b-q’d. 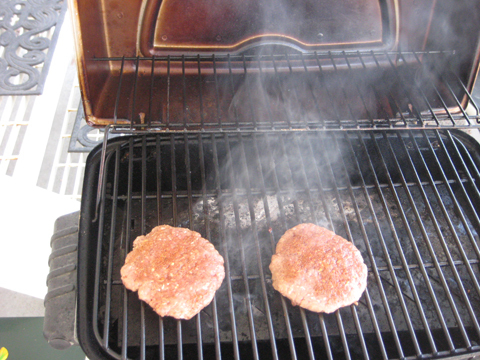 So after our train ride, I came home, prepared some meat patties and put them on the grill. Of course, the whole time I was watching them, I stood as close to the heat as I could to stay warm. The rest of this week is looking pretty dismal, but maybe by Saturday, we’ll reach the 70’s again so I can start to hope that summer wasn’t here for just two days. I skimmed my feed reader quickly at work and thought you had a BBQ on the train platform, hahaha! Hey.. that’s not a bad idea. The grill is portable, but I don’t think I could have made enough burgers for 400+ people. It was bad enough most of the people there took 5-6 waters, 12 cookies and 20 Nature’s Valley granola bars per person. Of course, this is a free event in Utah we are talking about. TRAX runs about 17 miles, at least the main leg. It goes to the Union Pacific station, which is right next to the new Front Runner which should connect to a train to NYC. We also have Amtrak here as well.